What were the earliest forms of the initial necklace? Personalised letter initial necklaces are one of the most fashionable ways that monograms show up in today’s’ latest fashion trends. The current mania for initial jewellery is a revival. While today we see monograms as a decorative way to embellish jewellery, the tradition of hand engraving initials can be traced back to the early ages when monogramming was one of the earliest forms of identification, found on Roman coins with markings of their rulers’ initials. The coins of old Greek cities were discovered with the same use of initials, allowing us to identify the ruler of the region from which the currency originated from many many years ago. The word monogram itself derived from two Greek words, ‘mono’ meaning sole, and ‘gram’ meaning letter, and was defined as ‘characters composed of two or more letters interwoven, often being an abbreviation of a name’. These early monograms consisted of two letters, while later, during the Victorian era traditional monograms began to consist of three letters. Other than appearing on coinage, over time the hand engraving of initials became the common was to designate the property of nobility, with monograms becoming a statute symbol that was embroidered and emblazoned on their belongings, from tablecloths to armour. Beautifully hand engraved monograms were a passion and of great popularity in the Victorian era. Members of the Victorian aristocracy often used the monogram as an emblem of their high rank in society. There were strict standards for the monogram form during this time, and the early tradition of only two initials became a thing of the past, and the three initial monogram we see today emerged with great prominence. A woman’s monogram during the Victorian era consisted of the first initial on the left, the middle initial on the right and their initial of their married name was to be in the middle, larger than the other two initials either side. While the monogram has a long history and a very close connection to royalty and aristocracy, it has continually been used throughout the years because of the simplicity of the design as well as the beautiful and elegant touch initials add onto the item on which it is hand engraved. What started as a strictly personal way of identifying personal belongs, personalisation is a way to brand one’s identity. For example, renowned artist Rembrandt landed his, now, instantly recognisable initials on his work after eight years or numerous variations of his monogram. Louis Vuitton’s son Georges was the creator of the now famous ‘LV’ logo, first monogrammed on the leather goods of his family’s company in 1876 to prevent counterfeiting of the Parisian company’s designer luggage. And two interlocking C’s transformed the legendary Coco Chanel into an international symbol of elegance. But, we all know you don’t need to be a renowned name in the fashion industry to grace the monogram trend. Initial jewellery is a timeless piece to add to all of our jewellery collections, and a sure bet that it will be your go-to necklace or bracelet for both day and night. A simple piece adding great beauty and sophistication. The sentimental value of initial jewellery makes it the perfect gift for someone that extra special. Our Initial Jewellery collection offers various ways in which you can personalise your necklace or bracelet. The Initial Necklace or Bracelet is the ideal if you are just looking for a single initial to be hand engraved on your piece. 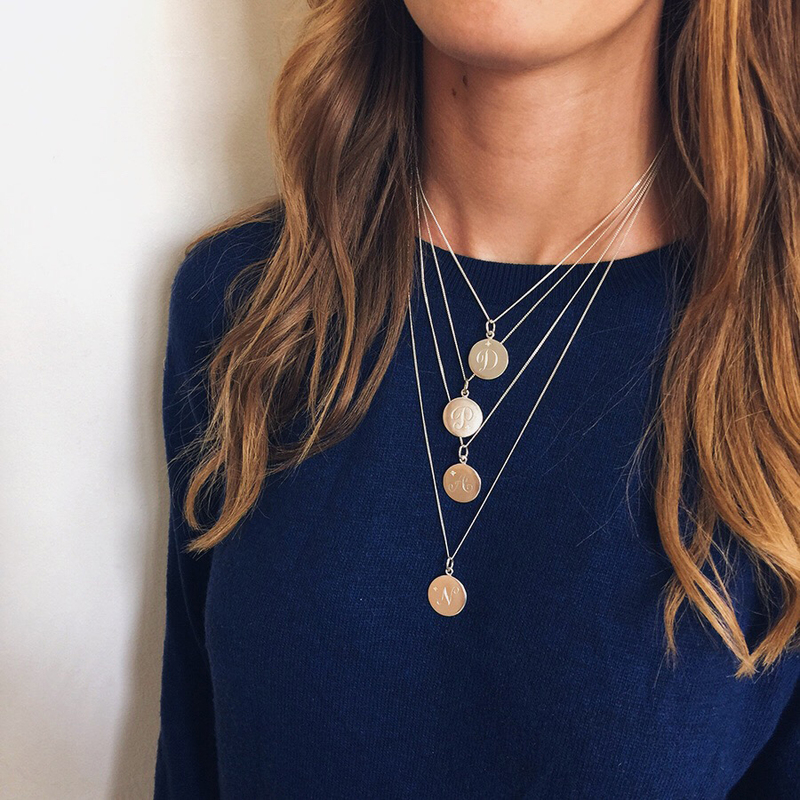 As one of our best sellers, the Initial Necklace is guaranteed to make the recipient of the gift have a permanent smile on their face every time they wear it. Make your initial jewellery even more special by choosing to embellish the disc with a precious gemstone; this could be a diamond, symbolic for eternal love or more personal by choosing a birthstone. Our blog details the stories, myths, legends and meaning behind each month’s gemstone to help you make your choice while further personalising the initial jewellery. Here is Liza’s story about her initial jewellery and just how much it means to her… friends, boyfriends, husbands take note! Not sure about which initials to choose? The Double Initial Necklace is a sure way to not only make her day but her year and more. Here are some ideas of what scrolled initials you could choose to have hand engraved on the disc. Why not make the necklace all about her, inscribing the initials of her full name. Or maybe you want to commemorate the treasured relationship between the pair of you, best friends, siblings, husband and wife. Double up and get both of your initials engraved. The ideal solution if you are stuck on what initials to choose, while also a sentiment of togetherness forever with the entwined initials on one disc. Initial Jewellery is also a great way to celebrate family love. 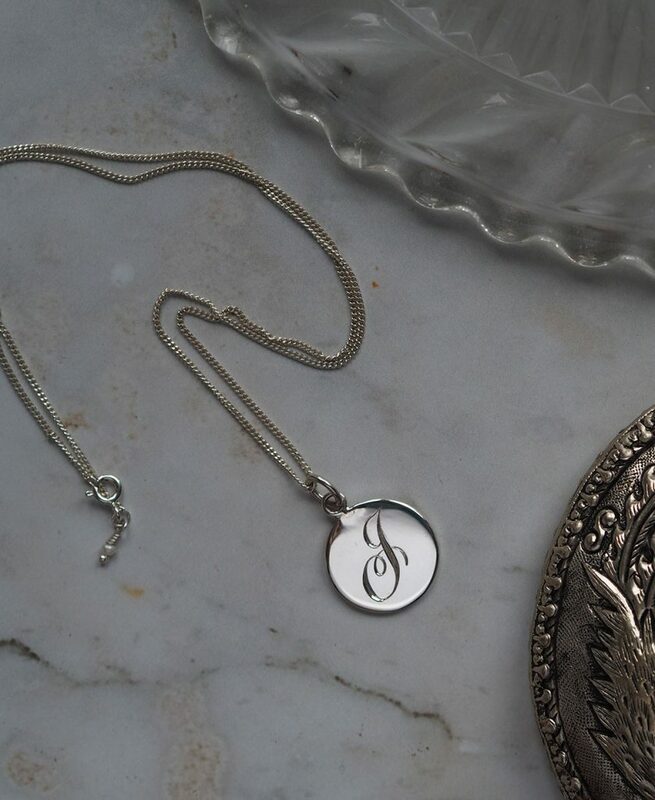 Why not get the initials of your parents, or siblings hand engraved on the disc, carry them with you around your neck even if you live far apart. A great little reminder of your family. Have more than two loved ones? Then the Triple Initial Necklace is the piece for you, allowing for an extra initial to be scripted onto the disc. The Triple Initial Necklace is new to our Initial Jewellery collection and is quickly becoming a new favourite. 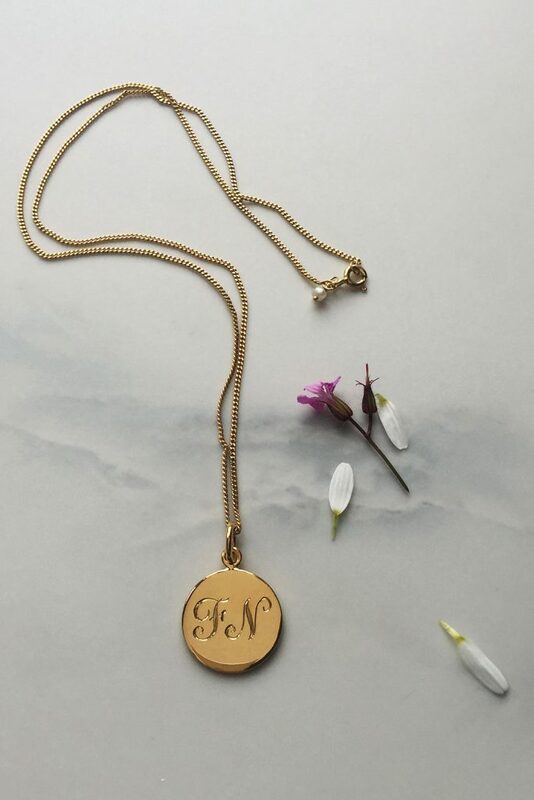 Inspired by the Victorian era when triple monogramming became a phenomenon, choose to get the initials of your girls’ full name hand engraved on the disc. For a newlywed or wife, celebrate that she’s now a ‘Mrs’ with her first and second initials and the initial of her new married name, a great way to keep a loving memento of the couple’s special day. The beautifully scrolled initials are entwined together, signifying and celebrating the union of their or your marriage. Initial jewellery is a sure way to give a truly personal and meaningful gift because she no doubt deserves the best. Our Initial Jewellery collection also now has the option to have the reverse of the disc also hand engraved with personalisation of your choice. How about another initial, short message or date? Please do email us for any special requests on orders@biancajones.co.uk and we shall do our very most to make sure that your jewellery gift will go the extra mile and spoil your loved one. The Initial Jewellery is available in sterling silver, 18ct Yellow or Rose Gold and also Solid Gold, to suit all preferences of precious metals whether that be team silver or team gold. A perfect personalised gift for any occasion, whether that be birthdays, anniversaries, graduation, valentines day and Christmas because she rocks your world.